The process by which evaluation of the job or work performance of the employees is carried out by the employers is called employee appraisal. There are other names for this process as well. They include performance review, performance evaluation, career development discussion and employee appraisals. Employee appraisal is carried out over a specific period of time and documented for evidence and future references. This appraisal process is a critical element of the overall career development of the employee. In other words employee job performance appraisal is a process of using a combination of documented and verbal components and managing the evaluation of the employee’s performance and achievements. Whatever the employer assesses from the appraisal, the result is also provided to the employee as a feedback mechanism. This enables the employee to bring about positive changes and improvements in his or her work and give a new direction to his efforts if needed. What is employee appraisal form? 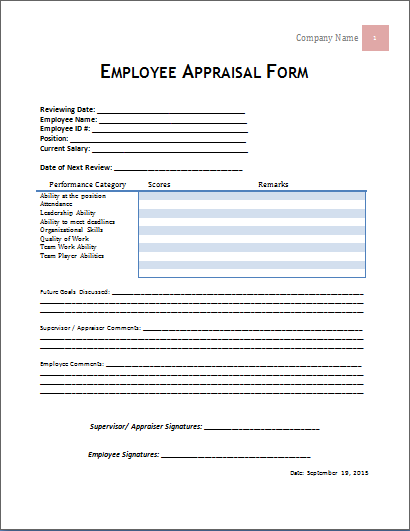 The employee appraisal form is a pre-written document that helps employees does a self-assessment of their performance. They are required to enter the goals and objectives of the employee during a particular period and whether he or she has been able to achieve those goals or not. If the goals are incomplete or the employee has failed, then the employer and the employee need to find out the weaknesses and how to overcome the shortfalls in goals accomplishment. All this appraisal discussion is documented and is used to support future increments in salary and during promotions in appointments.